Founded in 1893 by a team of seven engineers and businessmen the Ursus factory began producing exhaust engines and trucks. In 1930 the company was nationalised during the Great Depression and Ursus switched to making vehicles, machinery and arms for the Polish military. Not enough of them sadly as Germany (and the Soviet Union weirdly) successfully invaded and then annexed Poland in 1939, triggering the start of the Second World War. The Ursus factory, now under German control, was forced into producing arms for the German military, building Panzer II and Wespe tanks. Following the Allied victory in 1945 Ursus returned to making tractors, copying designs from Germany and working with Zetor of Czechoslovakia to dramatically increase tractor production in Eastern Europe. It worked too, with a combined 120,000 units produced across both brands annually at the firms’ peak. However, the Cold War loomed, and an over-ambitious state-sponsored expansion programme in the late ’70s and 1980s led to Ursus (and many other Polish businesses) incurring massive amounts of debt in the push for modernisation. Although up to 80% of these loans were eventually written off Ursus production was crippled, and now numbers around just 1,500 units a year. Builder Marek Markiewicz (aka M-longer) remembers happier times at Ursus when orders were c60,000 a year with his gloriously accurate 1980s Ursus 912 4-cylinder tractor. Using the wheels from the LEGO Technic 42054 Claas Xerion set has enabled Marek to build his Ursus big and as such it’s absolutely packed with detail. An opening ventilated roof and a pendular front axle also feature and there’s a whole lot more to see courtesy of Marek’s Flickr photostream and via the Eurobricks discussion forum. Follow the links in the text above for the full set of images of Marek’s brilliant Ursus 912. 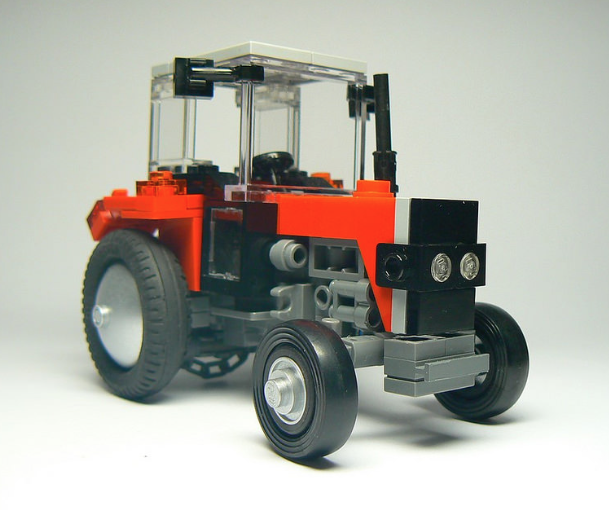 This neat Lego Ursus tractor (a Polish-built Massey Ferguson) comes from previous bloggee Damien Z. aka Thietmaier. It’s both beautifully constructed and photographed, and you can see all the images on Flickr here. Following today’s Technic Supercar we have another bright red technical marvel to share. It’s not quite as fast, but does have an equally boring name. This Ursus C-360 3P tractor is the work of Flickr builder Eric Trax, and it’s absolutely stuffed with Technic functions. These include remote control drive and steering, working power take-off and a lifting hitch attachment. Handily Eric has included a video of the Ursus in action at his Flickr page – click here to see more.